Identification: Robison and Buchanan (1988); Page and Burr (1991); Pflieger (1997). Native Range: Mississippi River basin from southern Wisconsin and eastern Indiana to South Dakota and Wyoming and south to Louisiana; Gulf drainages west of Mississippi River to Rio Grande, Texas, New Mexico, and Colorado. Absent in Ozark and Ouachita uplands (Page and Burr 1991). Table 1. States with nonindigenous occurrences, the earliest and latest observations in each state, and the tally and names of HUCs with observations†. Names and dates are hyperlinked to their relevant specimen records. The list of references for all nonindigenous occurrences of Cyprinella lutrensis are found here. Means of Introduction: The origin of most introduced Red Shiner populations can be attributed to bait bucket releases; however, initial introduction is often followed by the species' rapid multiplication, dispersal, and aggressive colonization (e.g., Hubbs and Lagler 1958; Minckley and Deacon 1968; Minckley 1973). In some areas dispersal of introduced populations has been aided by the presence of irrigation ditches and canals (e.g., Jennings and Saiki 1990). Koehn (1965) mentioned that the species has been introduced as a forage fish. According to Dill and Cordone (1997), it was introduced into northern California as forage, not as a bait minnow as suggested by Kimsey and Fisk (1964). The introduction into the Yadkin drainage, North Carolina, was possibly the result of an aquarium release (Moore et al. 1976). Hubbs (1954) reported this species as established in the lower Colorado River basin by 1953. He attributed the source of the introduction to escapes from the Arizona Fish Farms in Ehrenburg, Arizona. There apparently has been more than one subspecies introduced into the southwestern United States. Hubbs (1954) also noted that Red Shiners found in the lower Colorado River basin were intergrades between the subspecies N. l. lutrensis and N. l. suavis. In contrast, Minckley (1973) reported that the Arizona specimens he examined more closely resembled the typical subspecies, C. l. lutrensis. Gilbert (1998) also referred it to the typical subspecies (C. l. lutrensis). Status: Established in areas outside their native range in Alabama, Arizona, California, Colorado, Georgia, Illinois, Nevada, New Mexico, North Carolina, Utah, and Wyoming. In contrast to Hubbs and Lagler's statement (1958), Becker (1983) found that there was no evidence to substantiate the presence of this species in lagoons of Lake Michigan at Chicago. Impact of Introduction: The Red Shiner is very aggressive and where introduced may dilute the gene pools of native Cyprinella via hybridization (Mayden 1989; Burkhead and Huge 2002). The Red Shiner is hybridizing with the Blacktail Shiner C. venusta stigmatura in Alabama (Mettee et al. 1996; Burkhead and Huge 2002). The Red Shiner has also affected the distribution and abundance of native fishes. For example, populations in the Moapa and Virgin rivers, Nevada, have been implicated in the decline of the native fish of this region, including Spikedace Meda fulgida, Woundfin Plagopterus argentissimus, and Virgin River Chub Gila seminuda (Moyle 1976; Deacon 1988; U.S. Fish and Wildlife Service 1990a, 1995). Members of this species may compete with and affect adversely young Colorado Pikeminnow Ptychocheilus lucius, an endangered species (Karp and Tyus 1990). 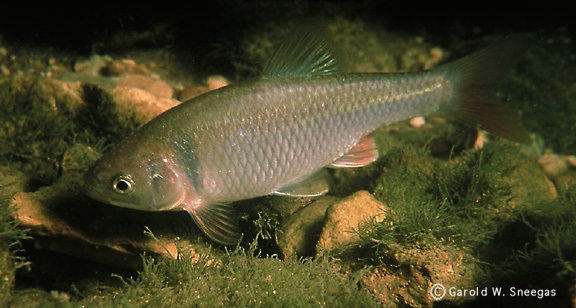 The introduced Redside Shiner Richardsonius balteatus declined when the Red Shiner became common in the Green River near the boundary of Dinosaur National Monument, Utah, in 1971 (Holden and Stalnaker 1975). In degraded streams in Georgia, introduced Red Shiners have become one of the most abundant species (Devivo and Freeman 1995). The introduction of Red Shiners into Utah was probably the means by which the Asian tapeworm entered the Virgin River; subsequent tapeworm infestation of Woundfin Plagopterus argentissimus, an endangered species, may be primarily responsible for the Woundfin's decline during the 1980s (Deacon 1988). Dill and Cordone (1997) called the Red Shiner the second greatest threat to the welfare of indigenous southwestern fishes, after the Mosquitofish. Remarks: The Red Shiner is a widespread and commonly used bait fish; it is also in the aquarium trade (Becker 1983; Etnier and Starnes 1993). It has been marketed in a pet shop under the name "rainbow dace" (Moore et al. 1976). Several attempts have been made to eradicate the Red Shiner from a portion of the Virgin River as part of the recovery plan for Woundfin and Virgin River chubs. It was successfully eliminated from the river between Washington Fields Diversion and Johnson Diversion, but have re-invaded below Johnson Diversion (U.S. Fish and Wildlife Service 1995). Tyus et al. (1982) gave a distribution map of the this species in the upper Colorado basin. Swift et al. (1993) and Dill and Cordone (1997) detailed the history of this species in California. Marsh-Matthews et al. (2011) examined recruitment and survivorship of Red Shiners 'introduced' to native communities in mesocosm experiments, and found that predation by piscivorous fishes (e.g., centrarchids) can limit the ability of Red Shiner to establish itself within a community. Although hybridization with Blacktail Shiner has been reported in areas where Red Shiner is introduced, Higgens et al. (2015) found little evidence for hybridization (using both genetic and morphological data) in two river systems where both species natively occur in sympatry. Glotzbecker et al. (2016) examined cytochrome-b variation across the native and introduced range of Red Shiner, identifying four distinct regional genetic lineages; introduced populations in the western United States were founded by introductions from the mid-west and western clades, whereas introductions in the eastern United States were solely derived from colonists from the mid-western clade. Burkhead, N.M., and D.M. Huge. 2002. The case of the red shiner: what happens when a fish goes bad? http://fl.biology.usgs.gov/Southeastern_Aquatic_Fauna/Freshwater_Fishes/Shiner_Research/shiner_research.html. Created on September 2002. Accessed on 06/04/2015. Burkhead, N.M., S.J. Walsh, B.J. Freeman, and J.D. Williams. 1997. Status and restoration of the Etowah River, an imperiled southern Appalachian ecosystem, p 375-444, In: G.W. Benz and D.E. Collins (eds). Aquatic Fauna in Perile: The Southeastern Perspective. Special Publication 1, Southeast Aquatic Research Institute, Lenz Design & Communications, Decatur, Ga.
Deacon, J.E. 1988. The endangered woundfin and water management in the Virgin River, Utah, Arizona, Nevada. Fisheries 13(1):18-29. Devivo, J.C., and B.J. Freeman. 1995. Impact of introduced Cyprinella lutrensis on stream fish assemblages in Georgia. Association of Southern Biologists Bulletin 42:129. Hocutt, C.H., R.E. Jenkins, and J.R. Stauffer, Jr. 1986. Zoogeography of the fishes of the central Appalachians and central Atlantic Coastal Plain. Pages 161-212 in C.H. Hocutt and E.O. Wiley, eds. The zoogeography of North American freshwater fishes. John Wiley and Sons, New York, NY. Holden, P.B., and C.B. Stalnaker. 1975. Distribution and abundance of mainstream fishes of the middle and upper Colorado River basins, 1967-1973. Transactions of the American Fisheries Society 104:217-231. Hubbs, C.L. 1954. Establishment of a forage fish, the red shiner (Notropis lutrensis), in the lower Colorado system. California Fish and Game 40(3): 287-294. Hubbs, C.L., and K.F. Lagler. 1958. Fishes of the Great Lakes region. University of Michigan Press, Ann Arbor, MI. Karp, C.A., and H.M. Tyus. 1990. Behavioral interactionsn between young colorado squawfish and six fish species. Copeia 1990(1):25-34. Marsh-Matthews, E., W.J. Matthews., and N.R. Franssen. 2011. Can a highly invasive species re-invade its native community? The paradox of the red shiner. Biological Invasions 13:2911-2924. Mayden, R.L. 1989. Phylogenetic studies of North American minnows, with emphasis on the genus Cyprinella (Teleostei: Cypriniformes). University of Kansas Museum of Natural History, Miscellaneous Publication 80, Lawrence, KS. Mettee, M.F., P.E. O'Neil, and J.M. Pierson. 1996. Fishes of Alabama and the Mobile Basin. Oxmoor House, Inc., Birmingham, AL. Moore, R.H., R.A. Garrett, and P.J. Wingate. 1976. Occurrence of the red shiner, Notropis lutrensis, in North Carolina: a probable aquarium release. Transactions of the American Fisheries Society. 102(2): 220-221. Moyle, P.B. 1976. Inland fishes of California. University of California Press, Berkeley, CA. Robison, H.W., and T.M. Buchanan. 1998. Fishes of Arkansas. University of Arkansas Press, Fayetteville, AR. Sommer, T, B. Harrell, M. Nobriga, R. Brown, P. Moyle, W. Kimmerer, and L. Schemel. 2001. California's Yolo Bypass: Evidence that flood control can be compatible with fisheries, wetlands, wildlife, and agriculture. Fisheries 26(8): 6-16. Swift, C.C., T.R. Haglund, M. Ruiz, and R.N. Fisher. 1993. The status and distribution of the freshwater fishes of southern California. Bulletin of the Southern California Academy of Sciences 92:101-167. Tyus, H M., B.D. Burdick, R.A. Valdez, C.M. Haynes, T.A. Lytle, and C.R. Berry. 1982. Fishes of the upper Colorado River basin: distribution, abundance, and status. 12-70 in W.H. Miller, H.M. Tyus, and C.A. Carlson, eds. Fishes of the upper Colorado River system: present and future. Western Division, American Fisheries Society. U.S. Fish and Wildlife Service. 1990. Spikedace recovery plan. U.S. Fish and Wildlife Service, Albuquerque, New Mexico. U.S. Fish and Wildlife Service. 1995. Greenback cutthroat trout recovery plan. U.S. Fish and Wildlife Service, Denver, Colorado.